The Beijing Olympic has come to an end. China brings down the curtain on Games that wowed the world with sporting brilliance. 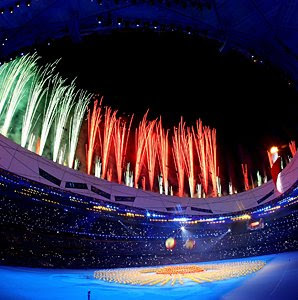 They close the Olympic with words of praise from Olympic officials and a feast of colors with deafening fireworks that showed glorious days they will cherish forever. Beijing Olympic games were truly exceptional. It was outstanding! loved it more when David Beckham kicked the soccer ball. he's sooo handsome!